Teotihuacán (pronounced " tay-oh-tee-wah-KAHN" with the emphasis on the final syllable) is a large and majestic archaeological site located about 25 miles (40 km) north of Mexico City. It is famous for its large pyramids dedicated to the sun and the moon, but the site also contains beautiful murals and carvings and several museums through which you can explore the city's fascinating history. This is one of the largest and most important archaeological sites in Mexico, and one of the must-visit sites on a trip to Mexico City. Construction at Teotihuacan began around 200 BC. Since the ethnic group and the language spoken by the inhabitants of Teotihuacan is unknown, they are referred to simply as "Teotihuacanos." At its peak between 300 and 600 CE, this was one of the biggest cities in the world, with around 200,000 inhabitants. Teotihuacan was abandoned around the year 800, which is considered the end of the Classic period in Mesoamerica. The causes of the fall are not known, but it's possible there was a prolonged drought or an epidemic. It's also possible that there was a conflict with another group or an internal conflict: some of the buildings show evidence of destruction by fire, as opposed to merely being abandoned, like many of the Mayan archaeological sites. The Aztecs considered Teotihuacan a sacred site even though it had been abandoned long before their time. Teotihuacan is the name that was given to the site by the Aztecs and it means "city of the gods" or "where men become gods." The Citadel: When the city was inhabited, this was the center of the city of Teotihuacan, but it is the southernmost point of the area open to visitors today. While visiting the site, keep in mind that the actual city of Teotihuacan extended over 12 square miles (20 km) and was intensely populated. The Citadel is a large open space with temples surrounding it that was probably used for ceremonies. Walk across the square and climb the steps on the opposite side to view the Temple of Quetzalcoatl. Quetzalcoatl was one of the most important gods in the Mesoamerican pantheon, and its name means "feathered serpent." The decoration on the facade of this building shows alternating heads of the serpent and another figure, sometimes called Tlaloc (the Aztec rain god). The building is also decorated with snails and shells, symbols of water. Avenue of the Dead: The Avenue of the Dead (Calzada de los Muertos) is the main axis of the ancient city. It stretches to the north from the Citadel all the way to the Temple of the Moon. Rather than being directed exactly north-south, the Avenue of the Dead is aligned to 16º northwest. This was apparently done purposefully to come into alignment with the setting sun on a certain date. On the days of the fall and spring equinox, Teotihuacan is packed with folks who dress in white and climb to the top of the Pyramid of the Sun. They stand at the top with arms outstretched to receive the special energy of the site on that day. If you're not afraid of a few stairs (around 250), the views from the top are excellent. Just remember the old adage "don't look down" when you're on your way back down! Pyramid of the Moon: After seeing the beautiful scenery from the top of the Pyramid of the Sun, if you’re still up for more climbing, you can make your way to the Pyramid of the Moon for an excellent view of the Avenue of the Dead and the whole archaeological site from its northernmost point. Admission and Hours: Teotihuacan archaeological zone is open daily from 9 am to 5 pm. General admission is 70 pesos per person, free for children under 13. Free for Mexican citizens and residents on Sundays. 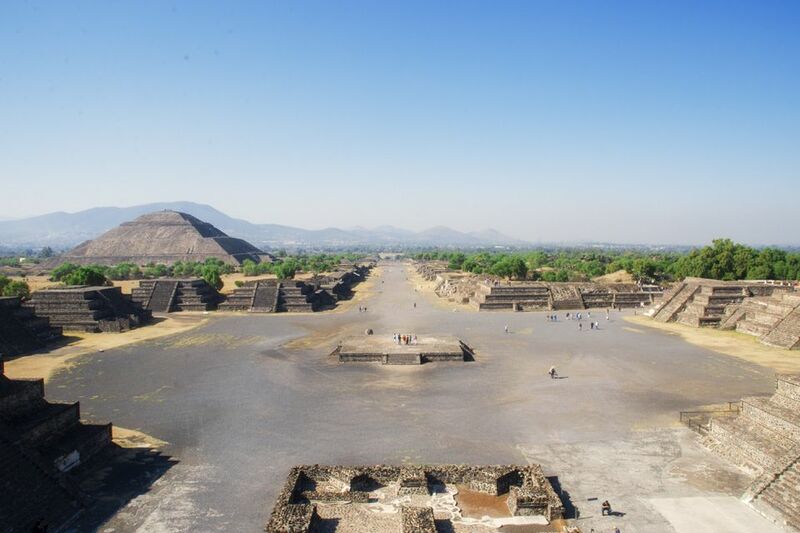 Getting there: Teotihuacan is located in the State of Mexico, northeast of Mexico City, There are many companies that offer day trips to Teotihuacan from Mexico City. One option is the Turibus Teotihuacan route which is an all-day excursion that includes a visit to the Basilica of Guadalupe as well as stops for lunch and shopping at an arts and crafts center. If you would like to spend more time exploring the site, you may prefer to go on your own. You can hire a taxi or a private guide to take you, or you can get there fairly easily using public transportation. Take the metro to the Central del Norte station and from there you can find a bus to the ruins. The buses are marked "Piramides." Tips for travelers: There are five entrances to the archaeological site. To do a full tour of the site, enter at entrance 1 at the south end of the site. You will walk the length of the Avenue of the Dead (about one and a quarter miles or 2km). For a shortened tour, many tour groups begin at entrance 2, level with the Pyramid of the Sun. This is a good option if your time is limited or you don't want to walk much. Don't forget to take water, a hat and sunscreen!